After a large campaign over the weekend for the internship crisis, where do we go to from here. Over the weekend a number of successful campaigns were run, mainly the #interncrisis Tweetathon and the Scrubs on the Street demonstration in Sydney. The success of Scrubs on the Streets was featured in The Australian. The Twitter Campaign was also successful in it's own right with over 100+ people being actively involved in the #interncrisis hashtag. For a summary of last nights tweetathon see the transcript. 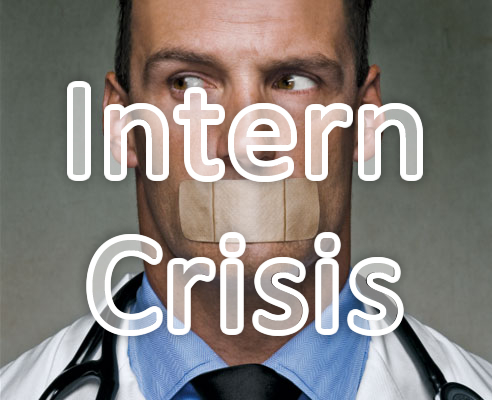 For more details on the #Interncrisis and how the campaign started go here. The campaign has really just begun and we need to continue, in collaboration with other lobby groups (e.g. 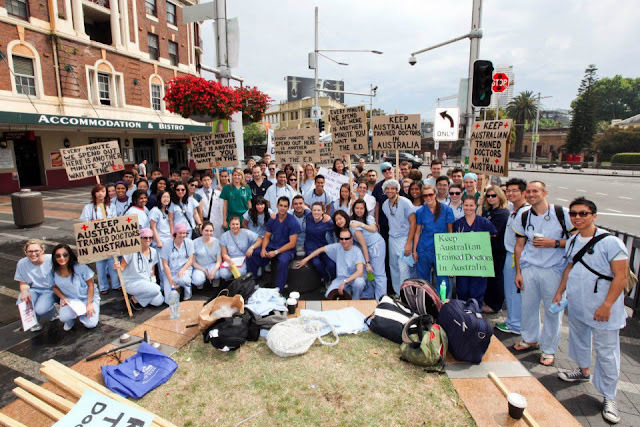 AMSA) to push the case for internships for all Australian Trained Medical Graduates. Q&A is on tonight and we would like the #interncrisis to feature if possible. Tweet & email Peter Mcevoy (executive producer of QandA) to request support. Send questions to the QandA website. Put lots of questions in as web submitted questions. Make quick videos of yourselves asking a question directed to one of the guests. Follow the #QandA hashtag and raise awareness during the program. Scott Morrison (Shadow Immigration Minister): the ethical problems associated with stealing much needed doctors from developing countries and generally the importation of doctors from overseas to make up for a shortfall in doctors when we have our own graduates who we could train. Amanda Vanstone: as a previous immigration minister could also be targeted. Peter Garrett: as a person who is meant to base his existence on social justice. Each week on Thursdays from 9pm AEST (that's 8pm for us Queenslanders) we will be running a tweeting blitz. This is an opportunity to raise issues surrounding the #interncrisis and even offering up possibly solutions. The key issue is to get your voice heard. In saying that continue with #interncrisis tweets throughout the week, this is just a standalone time for discussion and protest. Keep writing to the State Health Ministers. Contact your Local MP. Just make sure this issue does not disappear from vision. The Federal Health Minister has already come to the party to offer $10m to help fund the extra places, but states need to cough up $8m more (they refused). HOWEVER we can still ask Federal politicians from both sides to help apply pressure on their state colleagues. The main problem is in NSW, VIC and QLD so focus your efforts there. WA have been very supportive and have found the extra places (and more). Instead of confronting their state members, ask them for help to convince their colleagues in other states. PLEASE NOTE: Remember to be constructive, not destructive. AMSA and other stakeholders have worked tirelessly to help resolve the #interncrisis so we want to help their cause, not hinder it!